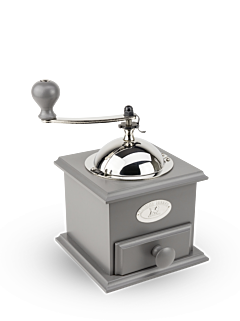 As an iconic piece born of historical know-how, the Peugeot coffee mill combines aesthetics and ingenuity, with a mechanism designed to amplify the subtle and powerful flavours of coffee beans. As true connoisseurs know, as soon as coffee has been ground, its aromas quickly oxidise and escape, with there being no means of preserving them or to remedy this. It is perhaps here, in its fleeting and volatile nature, that the real charm of freshly ground coffee lies. 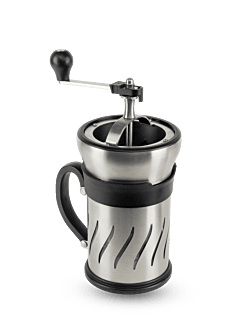 Thus, to preserve all the intensity, personality and flavour of a good coffee, it should be ground with a manual coffee mill, using just the right amount, before preparing it for the extraction of its powerful and full-bodied aromas. With an exclusive and unique collection, Peugeot is restoring all the charm and feeling of timeless coffee mills. Each mill is crafted from wood, and finished in a palette of classic colours from times past revisited for a more modern touch. While pleasant to handle, they feature a refined and elegant design. Figures in the interiors of yesteryear, with innovative functions and ingenious mechanism, they are also become statement pieces on kitchen coutners or dining-room furniture.